I still remember being in labor with my son like it was yesterday. Some parts have begun to get fuzzy, but others still stand out very clearly in my mind. One moment I remember in particular was during my last couple hours of labor while I was in the birth tub in our spare bedroom: I became overwhelmed with a sense of connection to all the other women around the world who were laboring with me at that moment. There I was in the security and comfort of my home, literally surrounded by women caring for and about me, including two skilled midwives and a midwifery apprentice. I felt extremely safe and enveloped in love, with my partner's hands supporting me and a midwife supporting my baby as he was born into this world. Birth is such an incredible, extraordinary life event, and at the same time it's the very definition of ordinary: something that happens over and over each day all around the world without much notice. Every day, 300,000 women around the world give birth, but not every woman has the privilege of making the choices about her birth experience that we are afforded in developed countries. Too many women go without prenatal care simply because there is no midwife or doctor available to attend to them and their babies. When Amber Strocel invited me to be a part of this project to blog for better birth outcomes, I jumped at the chance because I believe that every woman deserves to have the option to be cared for by a skilled medical provider during her pregnancy and birth. In Uganda today, over 100 women die while giving birth each week. 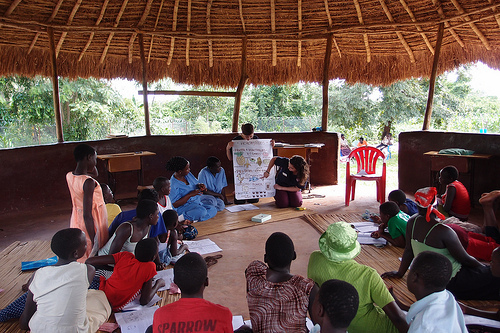 Maternal healthcare in Uganda is in critical need of help, which is why I'm writing today about an incredible program in which I hope you'll choose to take part: Shanti Uganda. Shanti Uganda is an organization founded on the values of community participation, unity, sustainability, and traditional values and knowledge. 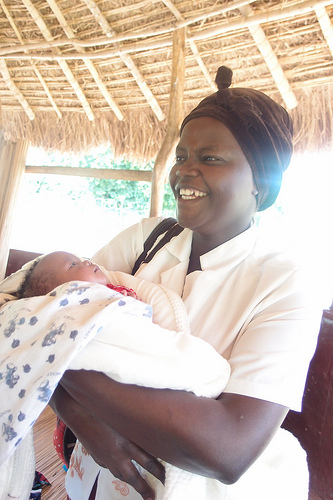 The Shanti Uganda Society "improves infant and maternal health, provides safe women-centered care and supports the well-being of birthing mothers and women living with HIV/AIDS in Uganda." 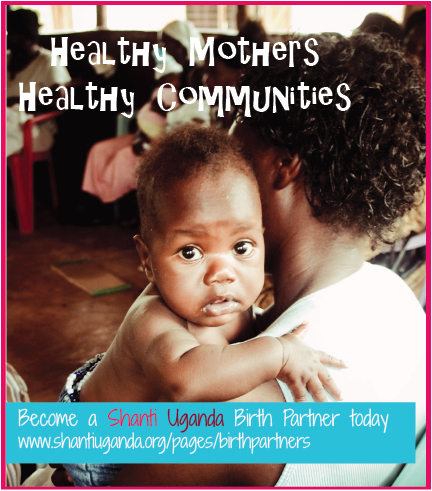 The Shanti Uganda Birth Partners program enables you to directly impact mothers and babies on the other side of the world. This amazing program gives these mothers the opportunity to have the kind of care during their pregnancies that we too often take for granted. Your regular donation as a Birth Partner will support mothers and their babies by providing reliable midwifery care, prenatal education, nutrition classes, yoga classes, sterile equipment and birth supplies, and all necessary lab tests they may need. Shanti Uganda is making a huge difference in the lives of women, girls, and babies in Uganda. These women are getting a chance to experience some of the healthcare and emotional & educational support that many of us have come to expect and rely on every day. As a special "thank you," if you sign up to be a Shanti Uganda Birth Partner by September 30th, you will receive a beautiful handmade necklace made by the Shanti Uganda Women's Income Generating Group. When you wear your necklace, you can be reminded of all the women in Uganda who are benefiting from your generous gift. I hope you'll decide to be a Birth Partner today; your support is truly invaluable to these moms and babies who need it. Beautiful post! This organization warms my heart. Mine, too! I wish there was more I could do to help, but I'm glad to have this platform to help spread information about their cause.